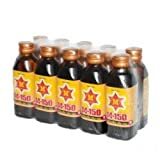 M-150 Energy Drink is a popular energy drink in Thailand and Asia. It can also be found in various locations around the world in specialty shops and online. It is the top selling energy drink in Thailand and has been around almost as long as Red Bull with a vary similar ingredient profile. M-150 also comes in a non-carbonated 150ml bottle (the original form) and would contain 48mg of caffeine. M-150 Storm is also available but the caffeine content of this version is unknown. 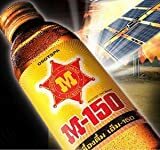 M-150 Energy Drink From Thailand Original 150ml. Water, Sucrose, Citric Acid, Taurine (0.4%) Caffeine (0.03%), Inositol, Preservative, Vitamins (Niacin (B3), Pantothenic Acid (B5), B6), Colors (Tartrazine, Sunset Yellow FCF), Flavorings (including natural strawberry). How Does M-150 Energy Drink Compare? M-150 Energy Drink contains 9.46 mgs of caffeine per fluid ounce (31.98mg/100 ml).